My husband had knee replacement surgery last week, so I have been fulfilling the roles of Bookstore Manager/Nurse/OffsiteBuyer/Chauffeur/StaffScheduler/PersonalChef/IcePackNinja for the last 14 days. It’s been tough. Not as tough that winter as the mom of three children under age 4 when everyone got chicken pox the week after we brought home the new Labrador puppy, but a challenge of scheduling and juggling nonetheless. Our summer activity schedule at the shop is in full swing, last-minute vacation travel shopping has been strong, and our student staffers are starting to think a lot more about new dorm rooms than extra shifts. We all manage these brief “mostly out of the shop” periods, of course, but I am particularly cognizant of our business owner coping strategies this time — perhaps because my “down time” is not on a beach with a book and a beverage, but in a lot of waiting rooms during physical therapy and followup appointments, where I have time to worry and wonder about my little shop’s health while I’m gone. The best investment of time I ever made in my store, apart from a cloud-based POS system, which allows me to log in from anywhere, anytime (take that, middle-of-the-night-insecurity-attacks!!) was a simple ring binder that the staff helped me put together several years ago. Every single task in our store has a page in this binder, with a very basic “we know you haven’t done this before” approach to explaining duties as varied as opening the store, receiving new purchase orders, changing the paper towel roll in the bathroom dispenser (that one’s tough), installing that little sticky price labels roll in the price gun (hint: YouTube video), setting up for Story Time, processing a return or exchange, closing the register, making a book order form for an author school visit, cleaning the bathroom so that Cynthia won’t yell at you…. it’s all in there. Each task has its own page, and while we try to keep it in some kind of order, it’s just this unaphabetical bible of bookselling, just for our store. We use it for new employee training, of course, for review when things go wrong, but mostly it’s a safety net that lives in the drawer right below the register, and anyone can access it anytime. Some days, I think that ring binder is a better manager than I will ever be. It always explains things step by step, doesn’t mind repeating, and is just happy to be there. Most staff texts to me begin with the phrase “I checked the binder, but I still can’t ….” which lets me know that the problem is real, and needs my attention (or maybe it’s time for another page to be written). My second saving grace in periods like these, with lots of “I’m not sure when I’ll be in tomorrow… can I text you?” messages from me back to staff, is an online scheduling system. Many stores use them, and for us it was a game changer. Staff can log in (from computers, phones, or tablets) to access the staff schedule, enter their conflicts, highlight their preferred shifts, and I can schedule weeks or months in advance. In addition, last minute cancellations can be addressed by the individual staffer — “guys, my dog is sick, and I’m going to the vet… can anyone close for me today?” can go out via text right away, and most times the issue is solved before I’m even involved in the swap. Additional notes for each shift can be attached, drawing attention to events underway at the store that might require time outside or offsite, which may change staff attire or availability. The very best part of this system was a little add-on that we developed to increase options for staff flexibility. Like many retailers, I can’t possibly pay my booksellers enough — a well trained staffer is worth so much more than I can afford at an hourly rate. What I can offer, though, is a schedule that recognizes their other obligations. Each week, when I enter instore shifts on the schedule for two to three weeks hence, I also add some blocks of time in the “open shifts” field. These are defined blocks of time — usually 2 to 4 hours each — that are required for some task to be accomplished that can be done offsite. Updating a mailing list, preparing a spreadsheet of summer reading participants, developing the materials for an event or an author school visit, making and sending a flyer electronically, updating an inventory record… all of these tasks can be done in a library, at a kitchen table, or in the nursery with a sleeping child. Staff members are welcome to “claim” these shifts on the store schedule, clock in remotely and be compensated for those hours, and email the completed task (or evidence of it) to me. Not only has this taken numerous items off my “to-do” list, but it allows staff the same flexibility to manage their work/family/life schedules that I rely on as a business owner. I like to think that we keep people longer, and happier, too, because we have the option to work from home sometimes. Much has been written in this space about great sales reps, and I would be remiss if I didn’t laud mine to the skies for their help when I’m gone from the day-to-day of shopkeeping. Great sales reps are the best partners a business owner can have. So-so sales reps and lousy ones (there might be a few of these, but I don’t know them anymore) are simply expenditures of time, and not worth column space, but great reps…. oh, the luxury. In the last two weeks, these great reps have visited my store to physically inventory displays (and restore order to the plush), sent me potential orders for refills, sorted out damage claims, co-op woes, and in one case, brought us a new fixture to replace a broken one. In addition, they have dropped by mid-day to check on the staff, brought treats and ARCs for particular staffers, and sent me texts complimenting employees they observed. They are the partners that I didn’t build in to my business plan, but could not function without. Next week brings the retirement of my husband’s walker (he’s mostly using a cane now), some part-time hours back at his office, and a new sense of independence for both of us. The dogs have enjoyed having us both home, but I think that we’re ready for longer days and a bit more to talk about over supper. I’d love to hear how you manage these non-vacation absences, too. 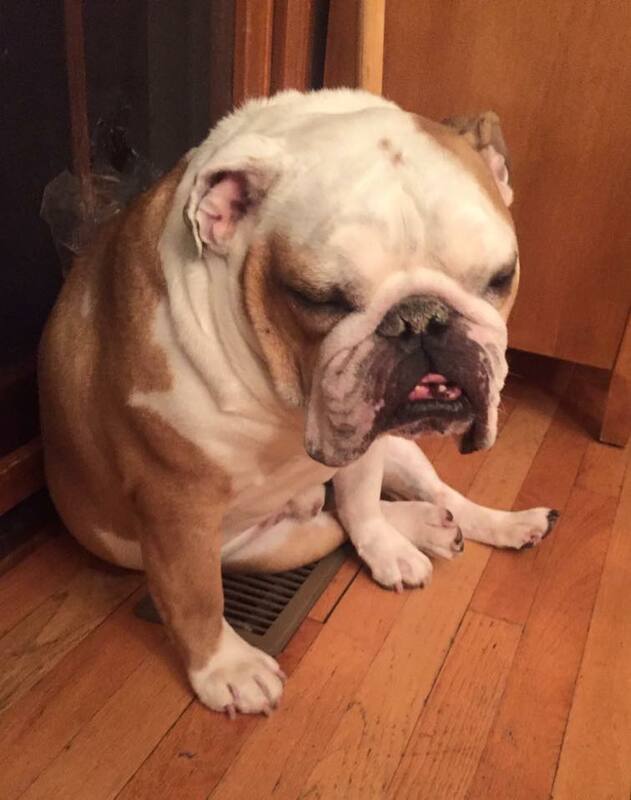 Gordon the bulldog, appreciating the air conditioning vent during Indiana summer. This entry was posted in Uncategorized on August 1, 2018 by Cynthia Compton.